When life presents an opportunity, you should take it, no matter the challenges ahead. This summer, I was presented an opportunity to be a part of Broadway Dance Center’s Junior Training Program in New York City. I had been to New York previously and taken classes at BDC, and they don’t mess around. Everyone who’s there walks in with a purpose; there’s no room for laziness. This summer I applied for their Junior Training Program, a three-week course for experienced dancers ages 13 through 17. As soon as I got the news that I had been accepted I couldn’t wait to start dancing. The day before my program started, I was a nervous wreck. I was about to walk into a new studio with new faces, and faced the fear of not being good enough. But I was reassured by the thought that everyone was there to learn, not judge. As soon as I walked into the studio, I observed a class. The amount of effort these dancers put in was incredible. I knew what I was in for. I met the staff, and I felt relieved. Everyone was willing to help me adjust to the new environment. The majority of the people I was dancing with were all new, so they were nervous too, but it didn’t take long for everyone to warm up to each other. There were teens from all over the world, from Dubai to Costa Rica. It didn’t matter that we lived thousands of miles apart, because we all came here for the same reason: to dance. The easy part of meeting everyone was over, now it was time for the hard part, the dancing. The dancing here was just like the city — face-paced and difficult. The first few days, I came out of the building drenched in sweat, and it felt like my body was physically and emotionally breaking. There was one teacher, in particular, whose presence was intimidating. The first few times I took Sheila Barker’s class, I tried to avoid her by standing in the back, but that didn’t stop her. If I were to miss a step she would get in my face and make it clear not to do that again. I couldn’t help but just stand there like a deer in the headlights. I realized her class wasn’t going to get easier so that meant I would have to work harder. After a while, I figured out that she was just a teacher with a big personality who just wanted the best for her students. All the teachers were inspiring. Each one had their own unique way of teaching, and I felt empowered after each class. 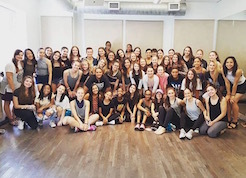 Back in Park City, my studio Park City Dance’s main focus is ballet, but in New York, I got to try so many different styles from musical theatre to African jazz. But my favorite would have to be commercial jazz. It’s an upbeat class full of personality. Overall, this was a remarkable experience that I will never forget. Those three weeks really shaped me into a better dancer physically and emotionally. I feel stronger and more confident. I learned to dance for myself and not for others. Also, I took away a new perspective on dance, and that is, the best performance you can give doesn’t come from choreography, but it’s what you give to the piece.